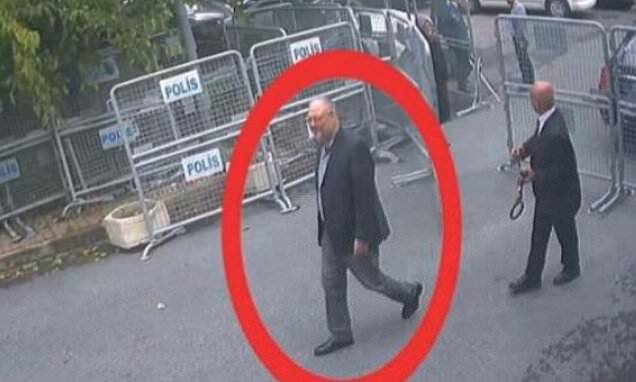 Saudi consulate staff tried to dismantle CCTV equipment at their Istanbul compound to help cover up the murder of Jamal Khashoggi, Turkish media have claimed. Workers attempted to tear out a security camera inside the building on October 2, the day the writer walked in and was killed, according to reports in Turkey. Attempts were also made at tampering with a video system in the police security booth outside the complex days later, it is claimed. According to Turkey's pro-government Sabah newspaper, a member of staff at the consulate went to access the police security post video system at 1am on October 6. Sabah said the same individual entered a digital lock code into the system to block access to footage showing movements at the entrance - including the moment Khashoggi arrived at the consulate. However, Al Jazeera reports that police had already deciphered codes and accessed the system before the attempted tampering allegedly took place. But he reiterated Ankara's stance that the directions had not come from King Salman. Friday Prayer we search our souls. we fail you. Resurrection - Light of resurrection light. may we hear You.